Why Implement a Spam Email Filter for Business? Almost every email service includes a default spam email filter of some description. So why would a business need to implement a secondary email spam filter to block unwanted emails and potential risks? The most compelling reasons are the volume of spam email that still evades detection, the time spent dealing with spam email, and the risk that an infected spam email is opened in error. Individually, the volume of spam email that evades detection by a default spam email filter may not amount to a lot – maybe four of five per employee per day. However, each spam email takes four or five seconds to identify and delete. If you multiple the four or five seconds by a thousand email users, the time taken to deal with spam email can equate to hundreds of days of lost productivity each year. Furthermore, each spam email that evades detection can potentially be a phishing email, or harbor malware or ransomware. A security-conscious employee may be able to spot each potentially unsafe email as it arrives but, within a network of a thousand email users, the risk that an infected email is opened in error increases a thousand-fold. For these reasons it is important to reduce the volume of spam email to the minimum possible. SpamTitan´s spam email filter has a verifiable spam detection rate of 99.97%. This exceptional detection rate places SpamTitan among the top online security solutions for blocking email-borne threats such as phishing, malware and ransomware. However, it is not by accident that our spam email filter detects a higher percentage of spam email than other spam filtering solutions. Like most spam filtering solutions, SpamTitan uses a combination of Real Time Blacklists and SURBL filters to detect spam emails from known sources of spam. Our spam email filter also supports recipient verification to reject emails sent to non-existent email accounts, and allows system administrators to apply Sender Policy Frameworks in order to identify spoofed emails. What sets SpamTitan apart from other spam filtering solutions is a process known as “greylisting”. In the greylisting process, every incoming email is rejected and returned to the mail server from which it originated with a request for it to be resent. In most instances, the email is returned within seconds. Spammers´ mail servers however tend not to respond to the request due to being too busy, and the email is never resent. By eliminating spam emails from new sources of spam as well as known sources of spam, SpamTitan reduces the volume of spam email a business receives to the minimum possible. The high spam email detection rate is achieved with the minimum amount of effort by system administrators and IT personnel. 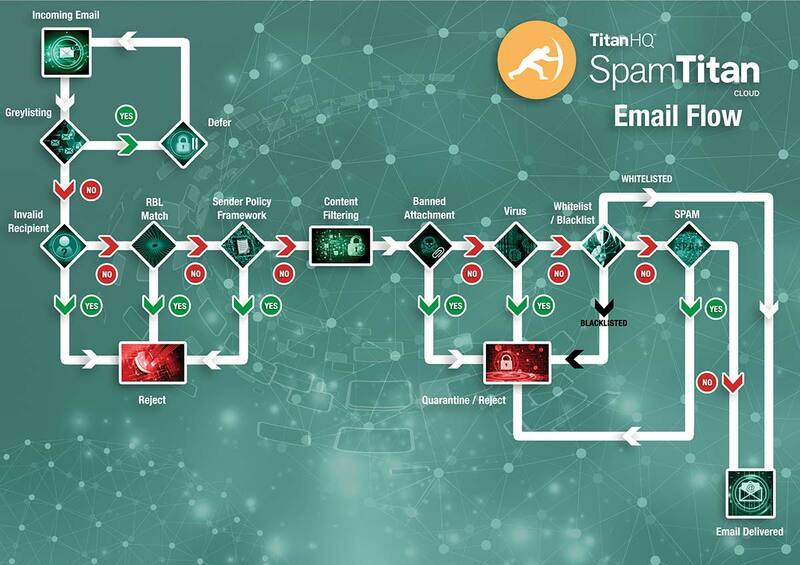 SpamTitan´s email spam filter comes in a choice of deployment options which are quick to implement, have no set-up costs and are updated automatically. As our email spam filter is managed via a central administrative portal – rather than as a per-client solution – it has practically no maintenance overheads. User policies and acceptable spam thresholds can be applied and adjusted as necessary via the portal´s intuitive interface, through which it is possible to whitelist or blacklist specific email addresses and schedule quarantine reports to identify emails not forwarded to their intended recipients. Depending on the size and nature of the network (SpamTitan supports an unlimited number of users and multiple domains), administrative control can be set-up at user, domain or group levels. Our email spam filter can also be set-up to scan outbound emails. This can have multiple benefits for a company if a virus has been inadvertently introduced into the network, or if a cybercriminal is attempting to compromise a company email address to use as a source of spam email. The early identification of a virus or compromised email account can prevent the company´s IP address – and potentially its website – being blacklisted by other email filtering solutions. If you have concerns about the volume of spam email entering your network, and you would like to reduce the volume of spam email to the minimum possible, you are invited to take a free trial of our email spam filter to witness its high spam detection rate and ease of use in your own environment. Implementation of our “Gateway” or “Cloud” solutions is both quick and easy and within minutes you could be protecting your network against the threat from phishing, malware and ransomware. To start your free trial of SpamTitan, simply click on the “Start Free Trial” button at the top of the page. Alternatively you are welcome to contact us with any questions you have about our email spam filter or to discuss your requirements with our team of Sales technicians. We also invite enquiries from Managed Service Providers, for whom a white label version of SpamTitan and a range of hosting options is available.